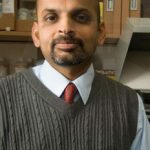 In collaboration with Dr. Sheba MohanKumar, our laboratory (Neuroendocrine Research Laboratory) uses an integrative approach to investigate the neuroendocrine consequences of prenatal programming from birth to aging related to regulation of the hypothalamo-pituitary-adrenal (HPA) and the hypothalamo-pituitary-gonadal (HPG) axis, metabolic function and cardiovascular function and behavior. Our laboratory uses both whole animal as well as molecular approaches to investigate these questions. We use a number of standard and novel techniques including stereotaxic brain surgeries, in vivo push-pull perfusion of discrete areas of the brain, in vitro perfusion of hypothalamus, HPLC-EC, RIA, ELISAs, brain microdissection, radiotelemetry, in situ hybridization, immunohistochemistry, mixed neuronal glial cell cultures, RT-PCR, TaqMan real time RT-PCR, Western blotting, etc. Our laboratory is also involved in developing techniques for imaging the brain to trace specific neurotransmitter pathways by using nanoparticles in combination with imaging modalities.